A conversion on the Iveco Daily van with work top, locker, shelving units, drawer units and various systems to lock down and transport cargo. 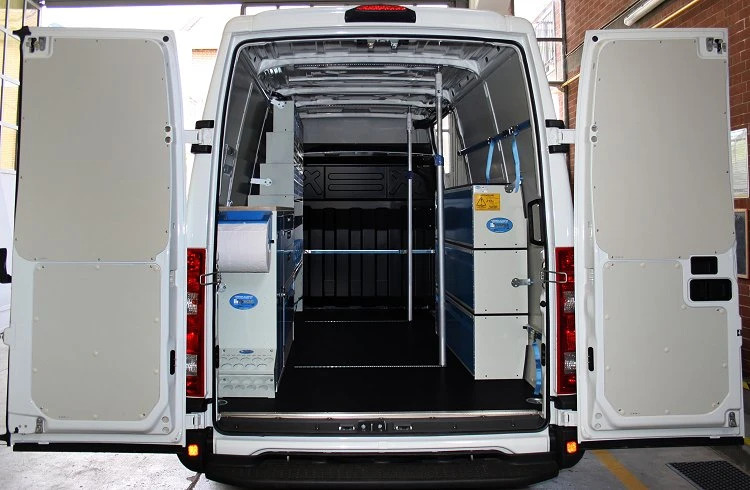 Since 1996, the Syncro System group has been exclusively creating upfits on vans for an extensive range of sectors, thanks to Syncro’s completely versatile system with a huge selection of shelving and drawer units, floor panels, interior linings and paneling, accessories, ramps and roof racks available for all van makes and models. One of the most important factors for commercial vehicles is the safe storage and transport of cargo of all shapes and sizes. In the Syncro catalog, you will find a vast range of hooks, straps, clasps, clamps, and load block bars and poles. You'll find everything you need to transport even bulky or fragile cargo without ever worrying about damaging the cargo or your van. 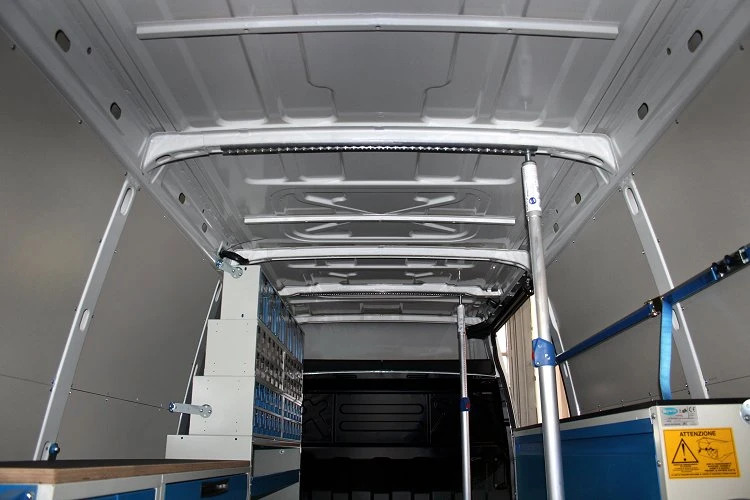 On this page, we see an example of a mobile workshop mounted on the Iveco Daily, with shelving components, interior paneling and poles to block cargo in place. 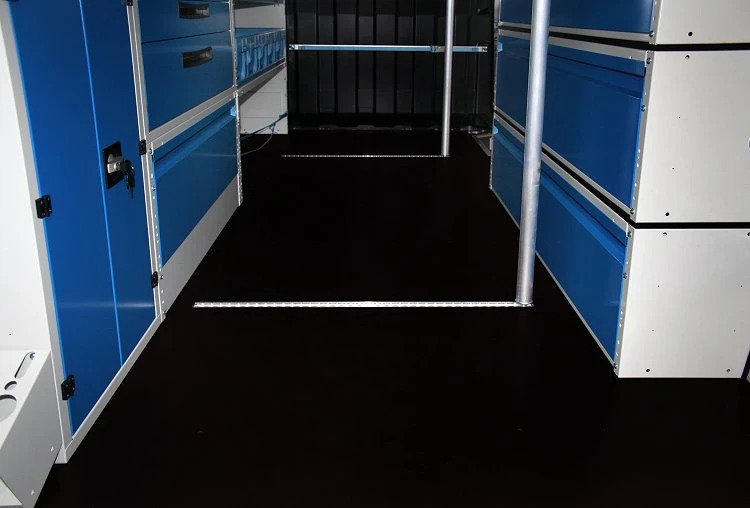 Starting from the bottom: on this Daily, we installed the 12 mm resin-coated plywood floor panel that assures a flat sturdy floor for the cargo area, as well as protecting it from any denting or damage and creating a solid base for the racking units. It comes complete with stainless steel anti-slip borders. 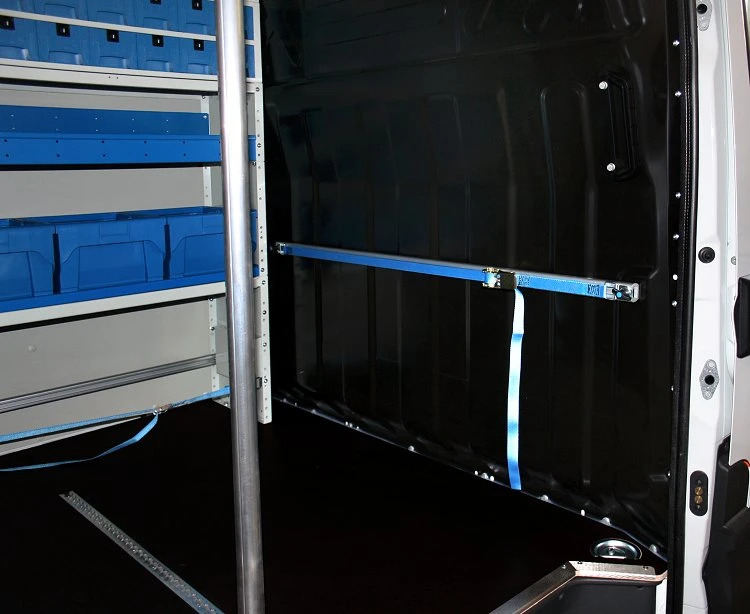 The protection of the cargo walls is ensured by robust, pre-painted, laser-cut, galvanized steel paneling also fixed to the back and side doors. Taking a look at the racking units, on the left-hand side, we installed a steel and aluminum locker with built-in lock. Next to that, we mounted the wheel arch frame base, complete with opening base board panel, allowing for practical use of the wheel well space. Above this, there is a steel drawer unit with two 10 cm drawers and a third 20 cm drawer. All drawers come with rubber mats and aluminum dividers, are mounted on telescoping ball bearing glides, and have individual automatic locking systems. Above the locker and drawer unit, we installed a sturdy 25 plywood work top. Moving toward the bulkhead, we see the Syncro safe case system. Placed just above that is a shelf with 5 CAS35 plastic bins – practical portable containers with double handles. There is also a shelf with dividers and a rubber mat. At the very top, we mounted a metal drawer unit with portable plastic drawers. The two drawer units, with a total of 24 polypropylene drawers, are topped with a second set of drawer units with 24 clear plastic drawers. Completing the racking unit, there are two more drawer units containing six forward-tilting plastic drawers. All drawers come with aluminum dividers to create extra compartments and are all equipped with individual automatic locking systems. There are a total of 54 drawers of varying sizes which can store up to 156 types of small parts and components. 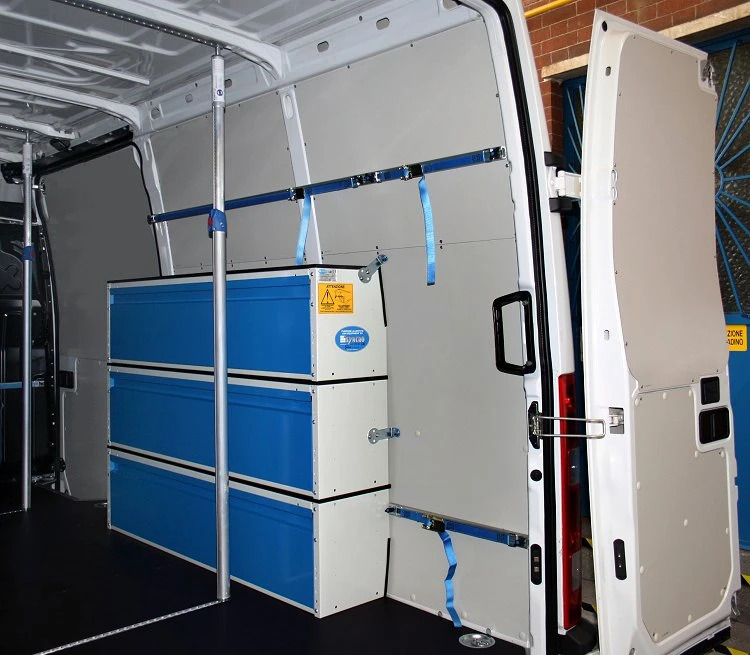 On the right-hand side there are also three closed shelving components each complete with front door panel, and resin-coated,12 mm plywood bases - the same as the van’s floor panel allowing storage of very heavy materials. 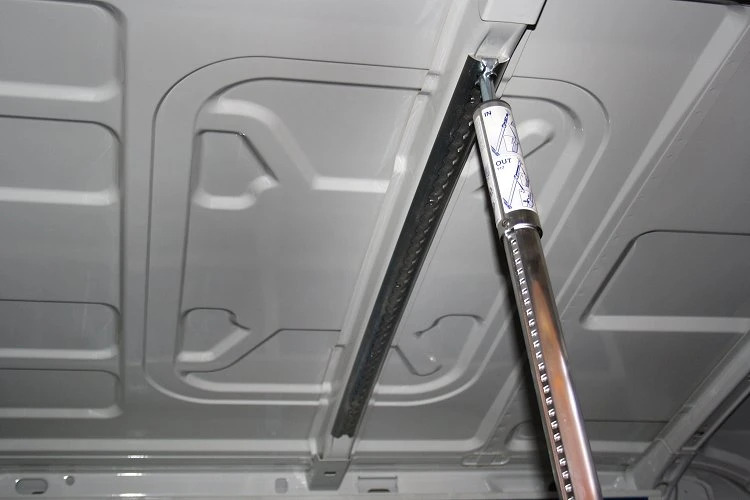 In the center of the cargo space, we fixed aluminum tracks to the floor and ceiling into which fit two pressure locking load lock poles. 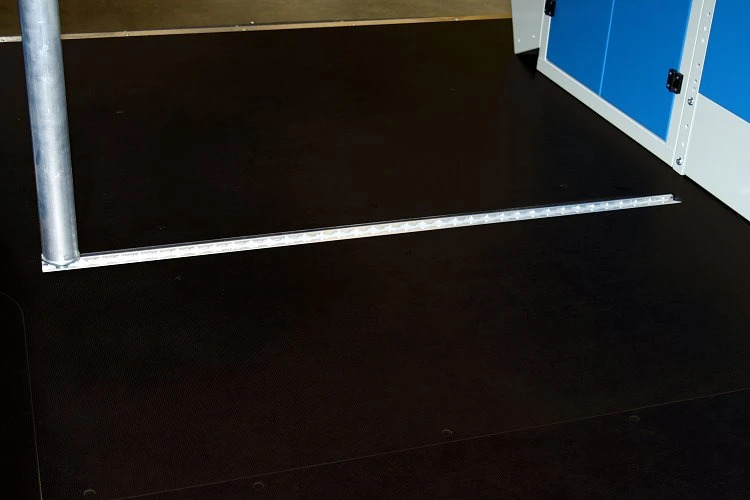 The poles can easily be inserted, removed and/or moved, according to the loading requirements. To lock down and transport other materials, we fixed tracks with straps and clasps to the bulkhead and the right-hand cargo wall. To transport silicone tubes, we mounted a tube holder on the end panel of the left-hand side racking unit, easily accessible from the back doors. Last but not least, we mounted a spray can holder on the left side wall. Click for a Daily with small van crane and generator/compressor, an upfit with generator and compressor, an upfit with roof-top ladder rack. Check out Daily upfit pages, and paneling and linings and roof racks. 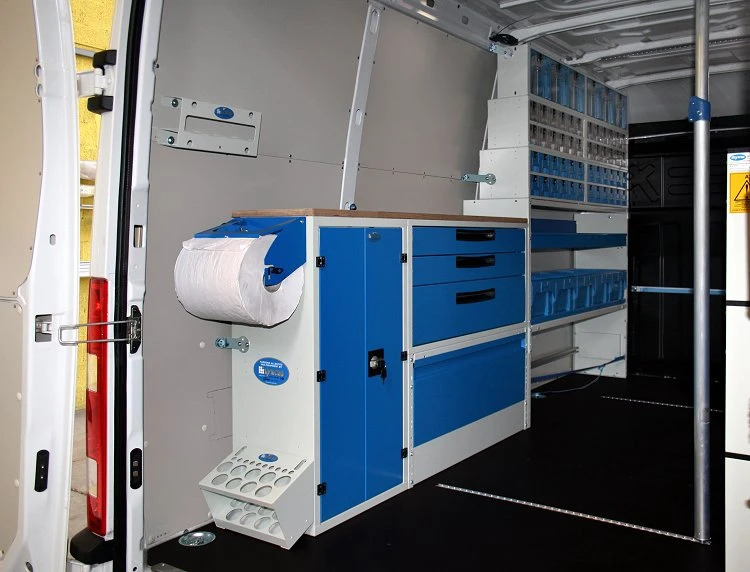 A mobile workshop conversion with interior lining, shelving, work bench and load block poles.